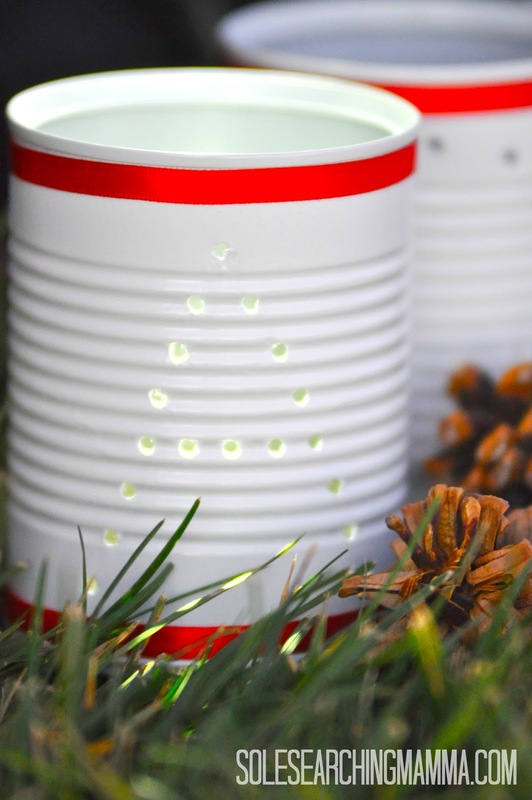 Sole Searching Mama: Make This Advent Memorable! On December 2nd, the Christian church will begin their celebration of the season of Advent. The literal translation of Advent, from the Latin adventus, is coming or arrival. It is typically used when referring to something extremely important. Advent is the anticipation of the coming of Jesus Christ, our Savior and our King. It's difficult to maintain a spirit of anticipation of the coming of Christ during Advent. Most of us, especially children, have a greater sense of anticipation toward decorating the tree, baking cookies, stringing lights and most of all opening gifts laid quietly beneath the tree by Santa on Christmas Eve. Advent has sort of become Christmas, and Christmas (which is typically celebrated for 12 days, up until Epiphany) has sort of become "take down the tree and make some resolutions" time. into the anticipation of Christ's coming. 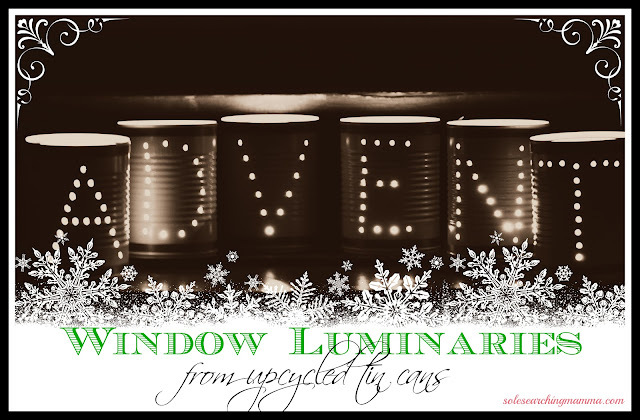 This year I created simple luminaries to put in the window of the kitchen. We will light them in the evening while having supper together. They would also look lovely on a fireplace mantle, a buffet or as a centerpiece on a table. After drawing the letters on each soup can (I used the large Progresso ones), I drilled evenly spaced holes along the letter pattern. A hammer and large nail would also work. Then, after washing the marker off (be sure and do this, or it will bleed through the paint), I spray-painted the cans white. Any festive color would be great, even metallics! 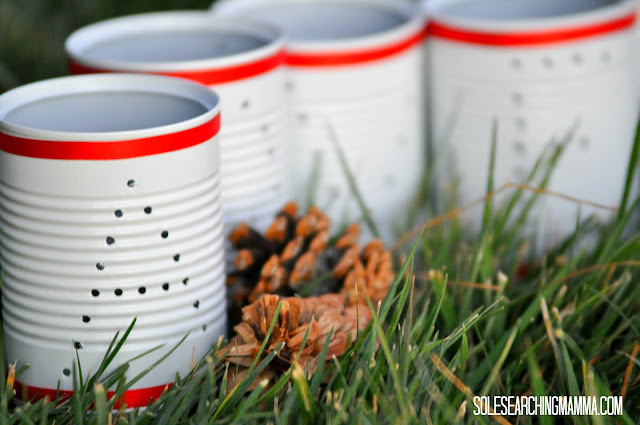 To dress the cans up, just embellish with ribbon of any coordinating color, if you like. Add a candle, and you're all set! 2. 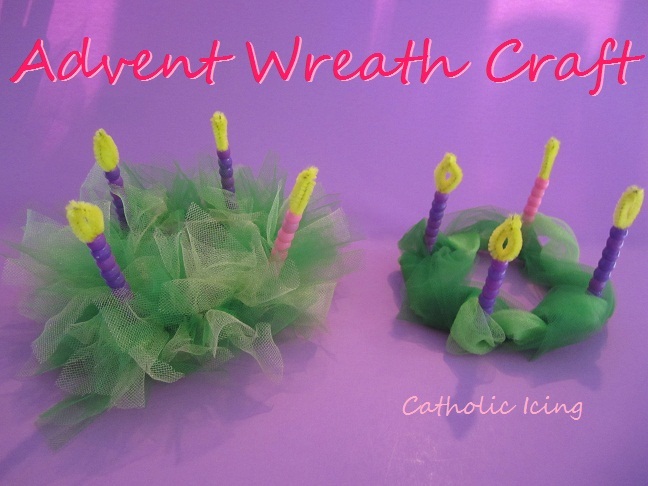 Purchase or create your own traditional Advent wreath with candles. 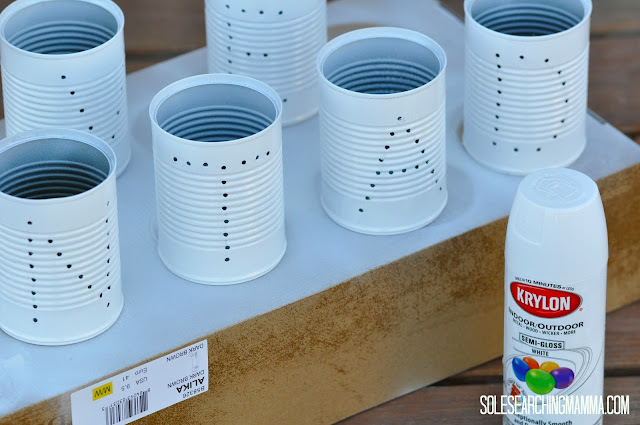 These adorable wreaths would be fun to make with the kids! Teach your children the history and significance of the wreath to make it even more meaningful. Light the proper candle(s) each night, gather round, say prayers and sing songs (we love O Come, O Come Emmanuel). 3. Create an Advent calendar of some sort, or purchase one with the windows that you can open, one for each day leading up to Christmas. I loved this idea from Martha Stewart. It would be so cute hung across a tall upright piano or even on a large mirror. 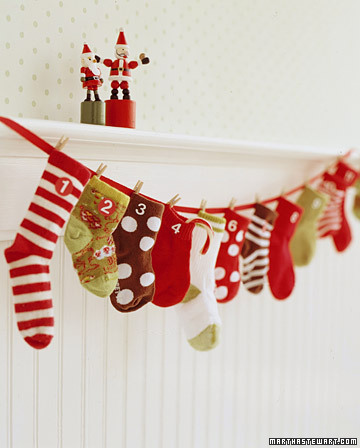 Place something small in each stocking to remind your family of Jesus. For example, pieces of straw (manger), a star (Star of Bethlehem), a cross, a lamb, etc. If it's in your budget, tuck in Christian ornaments that the children can add to the tree! 4. 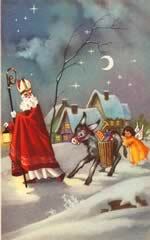 Celebrate the Feast of St. Nicholas on December 6. We have found a lot of great resources and ideas from this website and have created many wonderful memories with our children on this day this day together. 5. Print out some simple activity or coloring pages that your kids can enjoy while you make supper, or to keep the little ones content during evening prayer time. 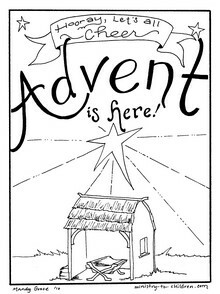 I found these Free Printable (Christ-Centered) Advent Coloring Pages online, printed out several copies and put them in a folder marked "Advent." 6. Finally, for my fellow homeschoolers, you can find various printable activities at Raising and Teaching Little Saints to incorporate into your religious education. Come back and visit us on Wednesday, when I'll be posting my favorite Advent and Christmas picture books! This is an excellent work, I will try this for coming up Christmas day, I hope it will add a strange beauty to my house. Great post! I've enjoyed inspirational ways to celebrate the Advent. 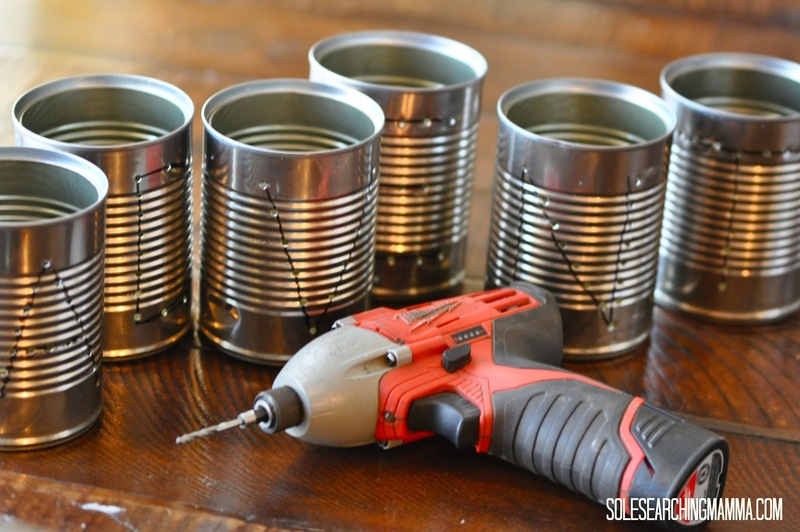 Punching those holes for your advent can must be a lot easier with the drill; I've did it with a nail and hammer and it was hard to hold the can still. Great ideas, but the feast day of St. Nicholas is on December 6, not 5... I'm from Germany, where we traditionally celebrate by putting shoes or boots outside the door the night before so that St. Nicholas can fill them with candy and goodies overnight. Thank you, Ute! That's what I get for typing too fast!! The date has been corrected :).